Today was our last day of level 5. Since David was gone, I was officially sous chef as well as 1 of 2 on dessert. Thankfully, I had Ian’s pork and mushroom ravioli in the fridge from the day before for the “scoobie snack”, and all I had to do was make a mushroom broth for the amuse bouche. Bobbie and I are on dessert for the first couple of days of the new menu and so we tried to prep for tomorrow’s new desserts while feeding restaurant goers who came in for the old menu. We prepped the dough for the apple baba and we made a chestnut ice cream. I don’t like the chestnut ice cream; the pureed chestnuts in a can are kind of gross and don’t really taste like chestnuts. Bobbie thought it tasted like refried beans. Hmmmm. Next time, I might take the long way: roast fresh chestnuts, puree them, and then add them into the base for the ice cream (yes, impractical, but chestnuts are in season now…chestnuts roasting on an open fire…). Tonight, I had to use up the boneless pork leg parts in our fridge at home, so I decided to stuff them, roll them, sear them and then braise them. I’ll explain my recipe and then show the pictures. 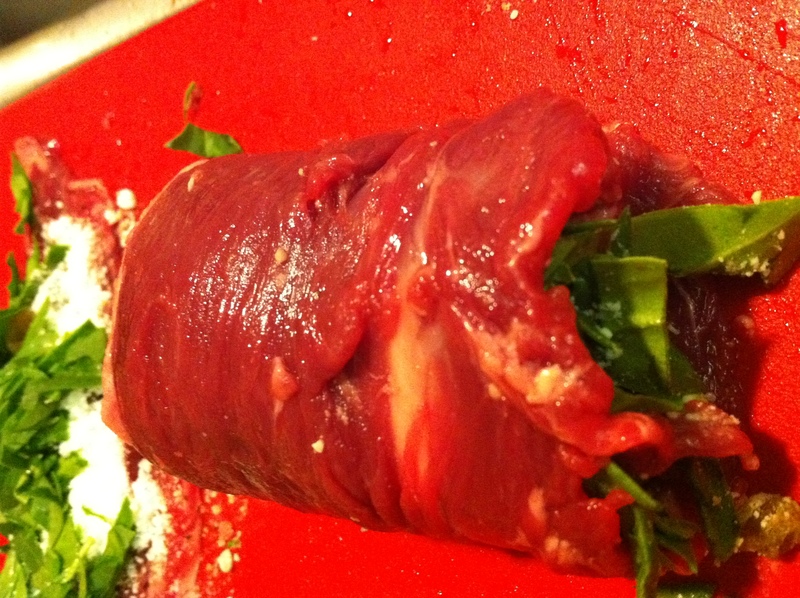 First, I pounded out the boneless pork leg parts. My meat came in 2 small parts, which were perfect for 2-3 people. 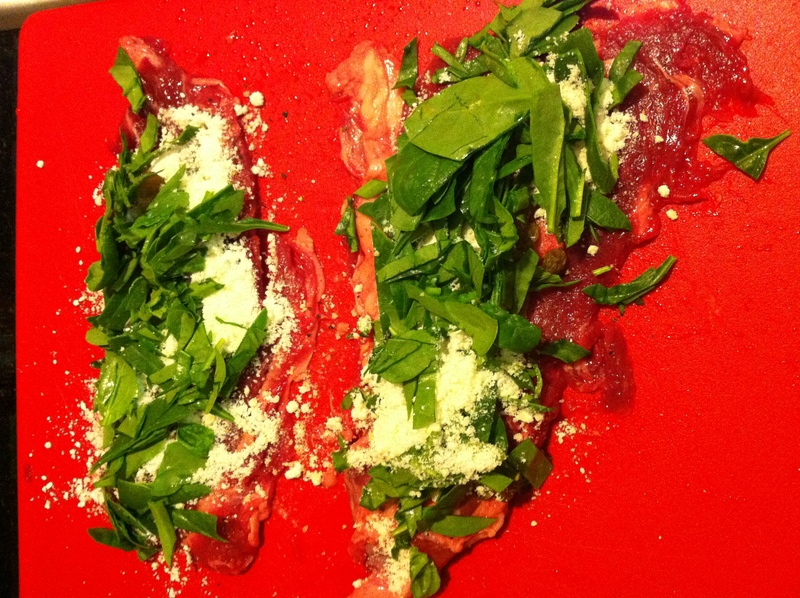 Then, I stuffed them with chopped fresh spinach, grated pecorino, and golden raisins. I probably should’ve added some nuts to the stuffing for textural contrast but I forgot until the pork was all tied. Next time! 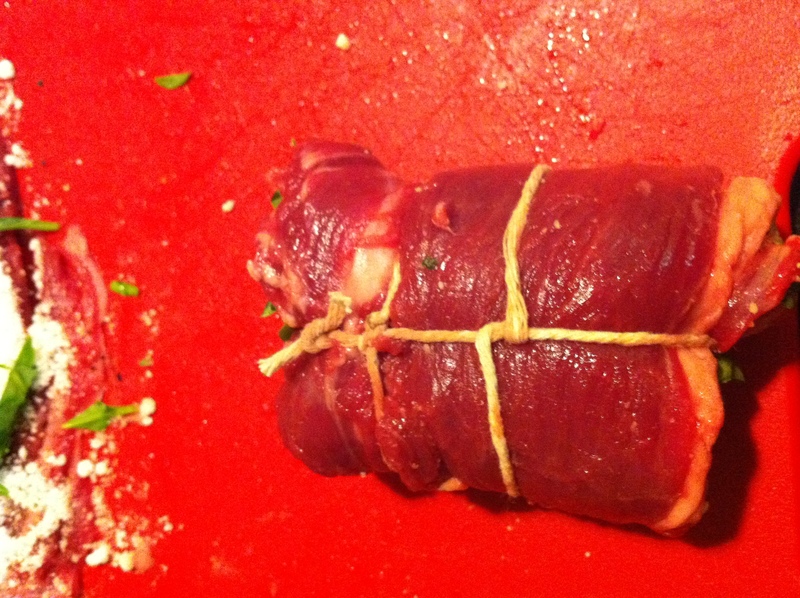 Then, I rolled them up, tied them, seared them in olive oil on all sides, and then took them out of the pan. In the searing pan, I added chopped onions and garlic. Then, I added some way too strong oregano, and then deglazed with about 1 1/2 cups of sauvignon blanc. I reduced that a bit and added 1 small can of whole peeled organic tomatoes (the 14 oz. can, not the 22 oz. one). I brought that to a boil, added some red chili flakes and salt, and then put the pork bundles back in the braising liquid on low simmer. 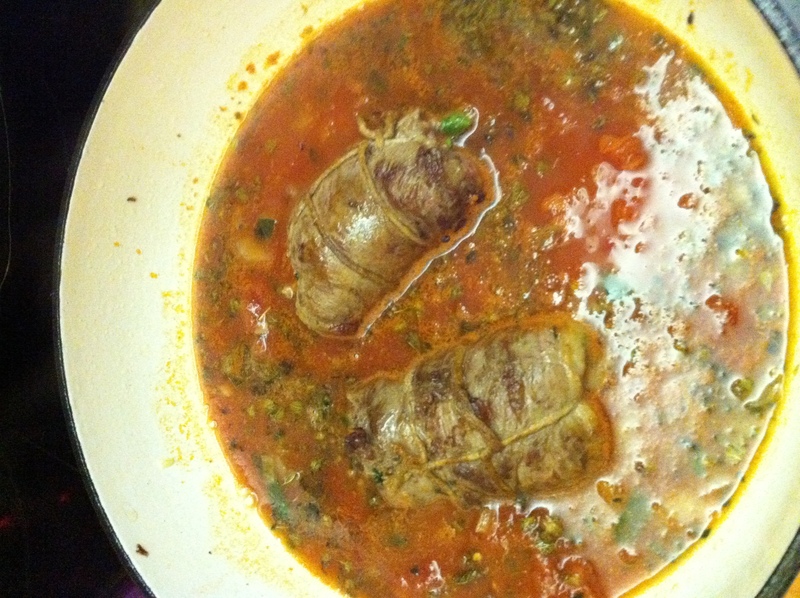 I simmered the small bundles for approximately 45 minutes, basting them every once in while. After that, I strained the liquid because the oregano was killing me it was so strong, then added in more tomato, a bit of sugar (my dirty little secret when canned tomatoes are too acidic) and reduced it a bit to make a nicer jus. I sliced the stuffed pork bundles; jus’d them up; chopped some more fresh spinach for the top; and had a lentil, feta, parsley and lemon salad as a side dish. Yum! If I could do it over, I’d braise the pork about 15-20 minutes less. The pork was very cooked and it didn’t need to be that done. The dish was still great, especially with the contrast of sweet and salty from the golden raisin and pecorino stuffing. But, it would have been excellent had I not overcooked it. One of the things that we started to do in our kitchen – that I love – is to use different color cutting boards for different prep ingredients. We use the blue cutting board for fruits and vegies and we use the red cutting board for meat only. Even though we throw the cutting boards in the dishwasher at the end of the night, using different colors still makes me feel better about preventing cross contamination, since it’s not always practical to send the boards through the dishwasher when prepping several different things in a row and hand washing them in between. It’s pretty easy to find different color boards out there today. And, if you’re a freak like me about not cross-contaminating things, this is very simple thing to do. 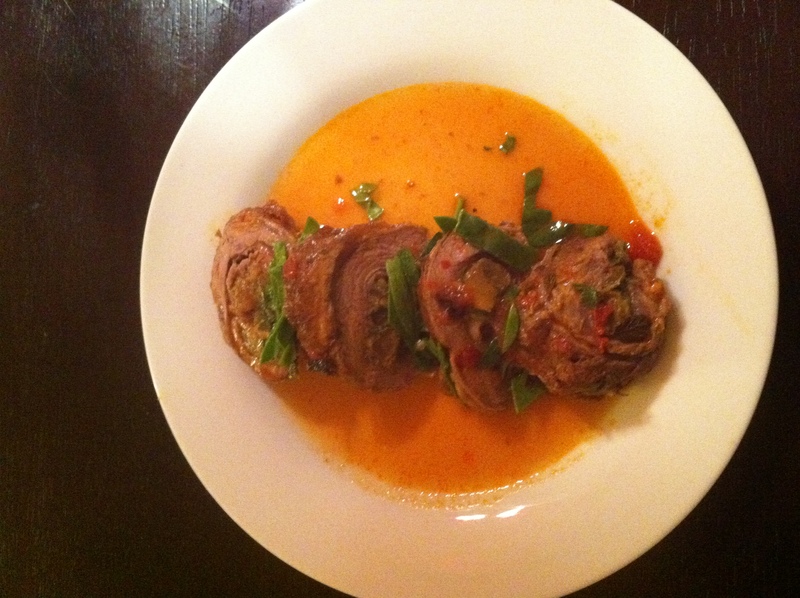 ← Day 99: Last day on rabbit and osso buco – yeah!